WASHINGTON — Bolstered by coalition air-power, Kurdish forces in Syria have entered the second week of fighting to seize the city of Raqqa, where nearly 2,000 ISIS fighters are battling to maintain control of their de facto capital in a bloody street-by-street battle. The fighting has slowed down inside of Raqqa, where just a week ago Kurdish fighters advanced rapidly to reach the historic walls of the Old City, a fortified area built in the eighth century by the Abbasid Caliphate. But as that battle rages on, Syrian regime forces supported by Iranian militias have penetrated east, just south of Tabqa city, toward one of ISIS' last bastions, the city of Deir ez-Zor and the small collection of Sunni majority villages along the Euphrates river. As ISIS rapidly loses territory, the U.S. and its partner forces in the region have come into increasing conflict with Syrian regime and Iranian-backed militias in a competition to control the strategically important Euphrates River Valley. 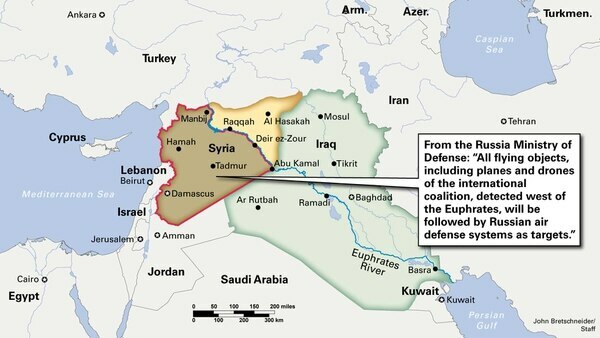 The river valley and city of Deir ez-Zor are strategically important to the goals of the U.S., Syria, Iran and Russia. For the U.S. it has been the scene of more than 360 airstrikes since March, and its location and demographics are important to U.S. strategy in Syria and Iraq. Deir ez-Zor is "where IS will survive, with Anbar on the other side of the border, unless it's rooted out," said Kyle Orton, a senior fellow at the Henry Jackson Society, a London-based think tank. The Sunni majority population in the Euphrates River Valley could complicate the U.S. goal of eradicating ISIS from the region. Analysts note that ISIS sympathies run deep in the region, and its proximity to the Iraqi border could become a destabilizing factor in rebuilding the war-devastated region and quelling any Sunni insurgency in a post-ISIS environment inside Iraq. "Many of the important Sunni towns are located in the valley" said James Phillips, a senior research fellow for Middle Eastern affairs at The Heritage Foundation, a think tank in Washington. In recent months, many ISIS leaders have fled Raqqa and Mosul for safe haven in the Euphrates valley. According to officials in Baghdad, the Euphrates valley is home to approximately 5,000-10,000 ISIS fighters. "Deir ez-Zor is another ISIS capital" and ISIS’ external operations center is located in the area, where it was once centered in Raqqa, said Jennifer Cafarella, an expert on the conflict in Syria for the Institute for the Study of War. 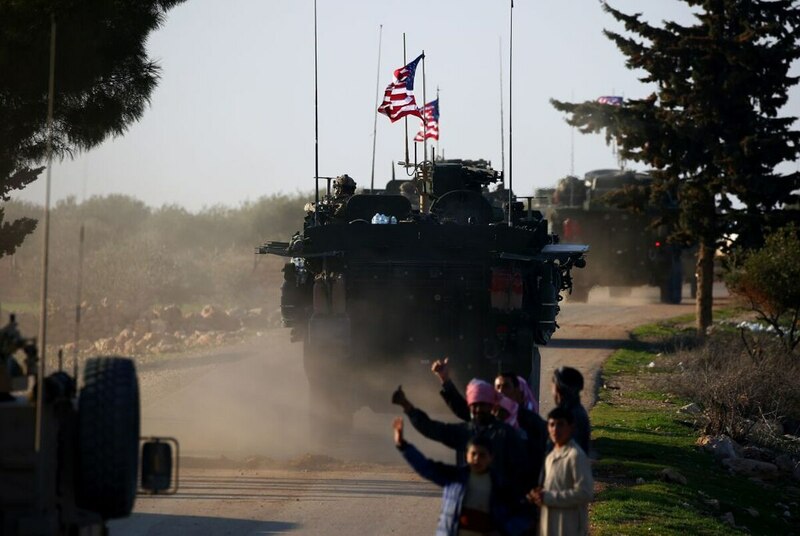 For Syria, "the Euphrates Valley is a very important communications and transportation vector," and control of the area will be vital for Syria to rebuild in a post-ISIS environment, Phillips said. The Syrian regime "has an ideological fixation on restoring total control" over Deir Ez-Zor, "and it is also the site of resources that can help make a reconstituted Assad state viable," said Orton. For Iran, it "needs eastern Syria to shore-up its hold on Iraq, its access to Hezbollah, and above all to prevent the Americans laying down anchor and disrupting this quasi-imperial design," he added. The shooting down of a Syrian-regime Su-22 by a U.S. fighter jet over the weekend was the latest escalation of hostilities between the U.S. and Syrian-regime forces and its Iranian proxies. On Sunday, Syrian forces seized control of the town of Resafa, an important junction on the road on the road to Deir ez-Zor, just 40 km south of Raqqa, according to the Syrian Observatory for Human Rights. The collapse of the ISIS militants holding the town followed clashes between the Syrian regime and U.S. Kurdish allies at a nearby village. A U.S. jet shot down the Su-22 in response to the hostile actions. The downing of the Syrian jet has added a new layer of complexity as the major sides in the conflict jostle for control over territory that has been held by ISIS. In response to the shoot-down of the manned Syrian aircraft, Syria’s ally in the civil-war, Russia, decided to cut off the deconfliction line — a communications hotline established by Russia and the U.S. to avoid mid-air collisions over the congested airspace in Syria — and warned it would track all U.S. and coalition aircraft with its air defense systems. "All flying objects, including planes and drones of the international coalition, detected west of the Euphrates, will be followed by Russian air defense systems as targets," the Russian Defense Ministry said in a statement, as reported by The New York Times. U.S. Central Command officials say they would welcome the Russians back. "The Coalition has not closed the deconfliction line and is always available to deconflict with the Russians to ensure the safety of Coalition aircrews and operations," CENTCOM officials wrote in an email to Military Times. "The deconfliction line has proven effective at mitigating strategic miscalculations and de-escalating tense situations." This is not the first time Russia has decided to cut the deconfliction time. Russia temporarily halted the hotline in April after the U.S. launched a cruise missile barrage against the Syrian Shayrat airbase in response to a chemical weapons attack allegedly orchestrated by the Assad regime. However, the hotline in recent weeks has become more important than ever to aid in decongesting the tight airspace over Raqqa, and has grown to include deconflicting military ground maneuvers between Syrian regime forces and its proxy elements, and the U.S. government's Syrian allies in and around the Euphrates river valley. On multiple occasions, the U.S. has used the line to warn pro-Syrian regime forces to stay at arm’s length from U.S. and partner forces operating near Raqqa and Tabqa cities, as well as those operating near a U.S. training facility for anti-ISIS forces in Tanf, on the border with Iraq in southeastern Syria. Some of those warnings were not heeded, and have resulted in U.S. airstrikes against pro-regime militias, including the downing of the Iranian Shaheed-129 drone and the Syrian Su-22 on Sunday. In both instances, U.S. officials in Baghdad contend they have used the deconfliction line with Russia in an attempt to end threatening activities being carried out by pro-Syrian regime forces. The major parties to the conflict, to include Syria and Iran, U.S. Kurdish partners and Free Syrian Army members, are inching toward conflict day by day as each side competes for territory lost by ISIS without any means of deconfliction, said Fabrice Balanche, a fellow at The Washington Institute for Near East Policy. "Assad and his allies think the U.S. wants to stay in eastern Syria," he said. "That is why they want to expel U.S. forces." With few means to deconflict operations and intentions, the possibility of open hostilities increases. CENTCOM officials continue to emphasize that the mission in Syria is solely to fight ISIS. "The coalition does not seek to fight Syrian regime, Russian, or pro-regime forces partnered with them, but will not hesitate to defend coalition or partner forces from any threat," according to a CENTCOM statement issued after the downing of the Syrian jet Sunday. But without a clear, long-term strategy in Syria, the U.S. risks becoming involved in a larger conflict.